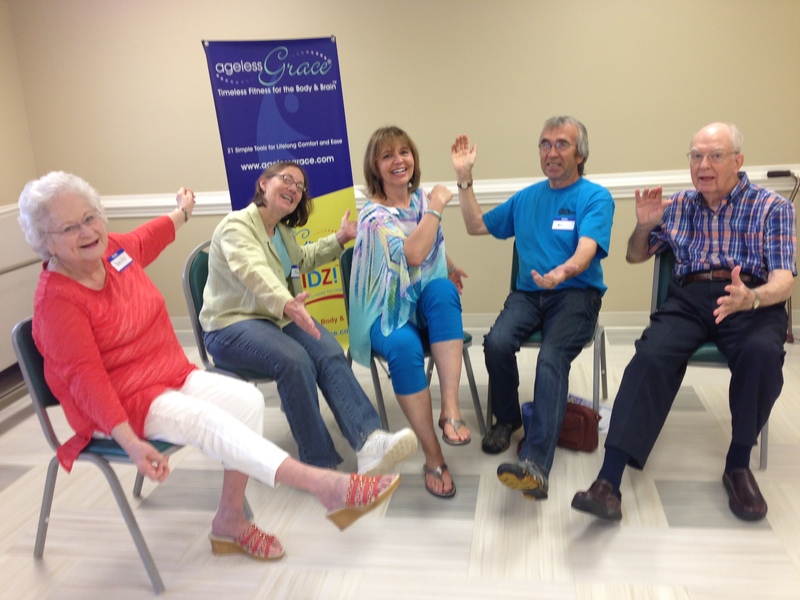 Ageless Grace brain and body fitness program is coming to Grace Ridge, Jan. 19-20. Juicy Joints, Gentle Geometry, Rockin’ Rockettes and Spaghetti Spine aren’t words you would typically use to describe exercise, but Ageless Grace® is no ordinary fitness program. Designed for healthy longevity of the body and brain, Ageless Grace® combines research from the areas of medicine, neuroscience, physical therapy, martial arts and fitness. The program’s 21 tools (movements) are based primarily on the science of neuroplasticity and help stimulate different areas of the brain: analytical, strategic, kinesthetic learning, memory/recall, creativity and imagination. “We’re so excited to bring this unique brain and body fitness program to Grace Ridge and the Burke County community. It’s a perfect complement to our Good Moods and Well4Life programs, which are also centered on staying active and vibrant while having fun,” said Evelyn Beaver, life enrichment director. The Ageless Grace® program was founded and created by Denise Medved, a leader in the fitness world and trainer for movement modalities for the last 27 years. Each of the 21 Ageless Grace Tools (movements) emphasizes different anti-aging techniques: joint mobility, spinal flexibility, right-left brain coordination, bone density, kinesthetic learning, cognitive function, systemic health, balance, fall prevention, self-esteem, confidence and playfulness. Grace Ridge will host free 30-minute classes at 4 p.m. Jan. 19 and 11 a.m. Jan. 20 for residents and members of the community who want to sample the Ageless Grace® movements in a social setting. The classes will be held in the Ervin Community Room; seating is available on a first-come, first-served basis. Those who wish to take their Ageless Grace® experience to the next level can register for a seminar or certification-to-teach course, which will be facilitated at Grace Ridge by Carol Gerson, an Asheville-based certified Ageless Grace® trainer. The 4-hour personal practice seminar on Jan. 19 is designed for those who want to establish a personal home practice or work one-on-one with a loved one. The 13.5-hour educator certification held Jan. 19-20 is to train and certify individuals who want to teach Ageless Grace® classes in work or public settings. Those interested in either the personal practice seminar or the educator certification must register online before Jan. 10. For more information download the Ageless Grace® flyer.